We’re in the b usiness of eating local! 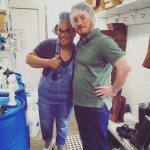 Last month some of our staff had the privilege of visiting Chapel Hill Creamery (CHC), a local dairy farm that’s been serving the Triangle with delicious, sustainably-produced food. We toured the creamery, walked the farm, met the animals (!!! ), learned about CHC’s farming practices, and helped make some cheese! CHC’s farming practices begin with the land. CHC cares for their animals and crafts their products in a way that enhances the environment and overall life of the farm. By finding ways to partner with natural cycles, CHC is able to create better products, have healthier animals, and ensure stability in the farm. CHC raises a closed herd of about 30 Jersey cows. 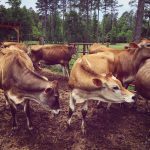 Known for rich, buttery milk, Jersey cows are ideal for creameries. These ladies are milked twice daily, and spend the rest of their time grazing in open pastures, enjoying the outdoors meanwhile replenishing the soil with nutrients. All cheesemakers have to account for large quantities of whey, a by-product of cheese. CHC gives the whey to their pigs. This acts as hydration for the pigs and adds rich flavor to the pork meat, which CHC also distributes throughout the area. 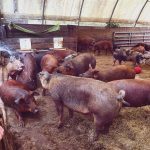 CHC continually improves their farming practices and is Animal Welfare Approved. 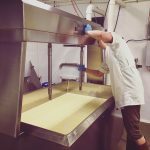 CHC has been crafting artisan cheese since 2000 and aims to serve a local market with great tasting, healthy products. Cheese production occurs throughout the week, and the entire process is carefully timed. The milk is processed before being formed into wheels and transfered to the cave, where the cheeses are brined, washed, or otherwise prepared for aging. Throughout the aging process, the cheeses develop rinds and are periodically rotated until they are ready for consumption! 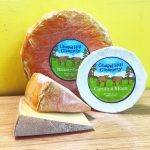 CHC’s three hallmark cheeses, Calvander, Hickory Grove, and Carolina Moon, are all named after local features. Each one of CHC’s artisan cheeses pairs exceptionally with wines or beer, in addition to a variety of t asty recipes. At the Durham Co-op Market, it is an honor to partner with hard-working and innovative vendors, and to share their delicious creations with our shoppers. 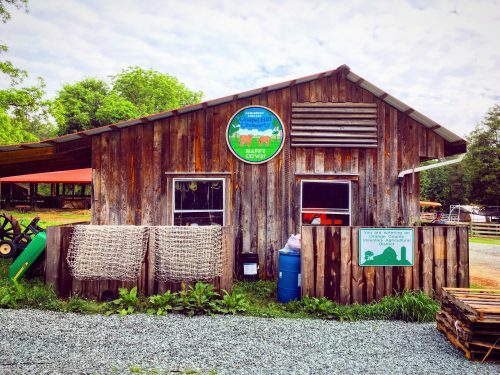 All Chapel Hill Creamery cheeses are currently on sale, so pick some up today or visit the store on June 23rd from 11-2pm. CHC will be in the store giving samples and sharing more about their fine cheeses. Come check out the selection, or learn more about Chapel Hill Creamery and their cheeses HERE.